'Sputnik-traps` installed on top of cages containing live Turtle Doves. 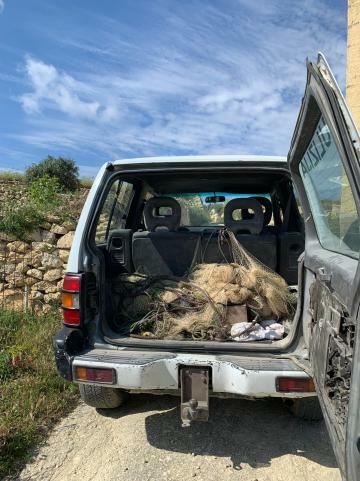 Illegal bird trapping equipment including a huge mist net were found over the past week as members of the Committee Against Bird Slaughter (CABS) led police officers to seven illegal trapping sites for Turtle Dove and Quail in Gozo. Two illegal cage traps were found near Għasri and the outskirts of Victoria, three sets of clap nets in San Lawrenz, Zebbuġ and Għasri, one ground net for Quail-trapping in Marsalforn and a massive vertical mist net which poachers had set up in a fenced property below the Gordan lighthouse. The mist net in the back of a police car. CABS said that the operation revealed that poachers have adopted a new technique to trap turtle doves with so-called sputnik-traps` which are installed on top of cages containing live Turtle Doves. Sputnik-traps are normally used by pigeon fanciers to secure returning racing pigeons in the loft; but attached to an aviary they are a very effective mechanism to trap wild birds. With a size of about 100 square metres the mist net found below the lighthouse was one of the biggest of its kind ever found by CABS on Malta and Gozo. “Its dimension and professional setup suggest that this trap was set up and operated by several poachers who intended to catch hundreds of birds with it“, CABS Press Officer Axel Hirschfeld said. "We expect the police to do their utmost to identify and question the owners of the compound where the net was found." According to CABS the mist net was installed in direct proximity of a large aviary which contained a number of Turtle Doves and songbirds. "Unfortunately these birds could not be properly inspected to determine their origin as no WBRU enforcement officer or court expert was available“ Hirschfeld said, adding that it was obvious that the birds in the cage have been caught illegally and also served as decoys to lure more birds into the mist net. As the police officers on site were not trained in bird identification, the birds were left in the aviary without a detailed inspection, Hirschfeld stated. 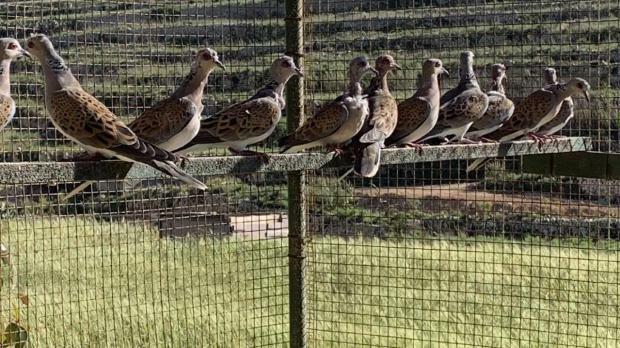 The NGO said its activists counted more than 1.400 live Turtle Doves being kept alive in aviaries close to hunting hides around Malta and Gozo. "As trapping of live Turtle Doves has been banned since many years we wonder where all these birds are coming from“, CABS Operations Officer Lloyd Scott said adding that it is impossible that such a huge number of birds have been bred in captivity. CABS criticised that the law does not require that breeders have to equip Turtle Doves with closed rings thus making it impossible for the police to differentiate between captive bred and wild-caught birds. "This is a massive legal loophole which makes enforcement a mission impossible. We therefore urge the government to change the law and introduce a scheme for the registration and marking of live Turtle Doves kept in captivity“, Scott said.